Among the 53 participants this year is Henry Spencer, a graduate guitar student at the university. Mr. Spencer enjoys playing Bach transcriptions for guitar, and for him, it mingles naturally with more contemporary genres. “Yeah, I just saw the Dead and Company play last weekend and that was a great show. John Mayer was filling in for Jerry (Garcia), but he still did a great job. RIP Jerry." This is Mr. Spencer’s 4th year attending the festival and he said its reputation is growing. People like Bradley Guerrant, who made the trip from Williamsburg, Virginia for classical guitar lessons. In the morning, students go to classes based on age and skill level. Each student pays a fee, though a limited amount of scholarship money is available. A second set of classes are offered in the afternoon following lunch. Guerrant came to the festival to learn about his craft and relearn the terrain of a university campus. This is his first year. 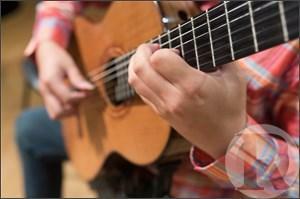 While classical guitar is different in style, sound, and build – it relies on nylon strings, providing a warmer sound. Mary Ackerman is a professor at Kennesaw State University near Atlanta and a long time instructor at the guitar festival. This week, Ackerman worked with middle and high school students preparing for the pre-college competition, now in its 12th year. One of the contestants, Jan Marie Laman, is rehearsing one of her performance pieces. Ms. Laman is a high school senior from Loudon County, Virginia. The next generation of guitarists is progressing at a faster clip, Ms. Ackerman observed. She believes it is, in part, because schools are investing in guitar programs. Ms. Laman said her introduction to the guitar occurred after dropping the piano and learning her brother’s motivations for studying music didn’t prove strong enough to continue. She found out about the festival through her guitar instructor and said it’s been an enjoyable experience thus far. To walk along the corridor of the A.J. Fletcher Music Building between classes is like walking across bridges between multiple generations – from elementary school students too small to carry their instrument cases to lifers in their 5th decade of playing. That diversity has been a feature and a goal of the guitar festival from day one, Dr. Elliot Frank said, and he wants that to remain as the festival proceeds in subsequent years. Dr. Frank is the festival’s director and founder. You’re listening to Collin Fullerton of Winston-Salem, last year’s solo competition winner, performing as part of the festival’s concert series. The Guitar Festival is over, but it is a yearly event. To find out more about it - visit the ECU School of Music's website or call their main office or e-mail Dr. Elliot Frank at franke@ecu.edu.